I’ve struggled with my weight ever since the end of year 11. We went on study leave, and I went pretty crazy in treating myself with food for working so hard with revision. This mentality only carried on throughout college, but reached it’s worst in my first year at university. I obviously moved away which meant I started to cook for myself, making myself unhealthy meals and eating chips and cheese after every night out meant that I was then at my heaviest weight. Around a year ago I saw a picture that someone took of me and absolutely hated how I looked. I knew it was time for me to change my lifestyle, I lost about half a stone by following Slimming World when I was in year 12, and I knew I could do it again if I properly put my mind to it. If you follow my Instagram, you’ll have noticed my weight loss transformation over the past year. 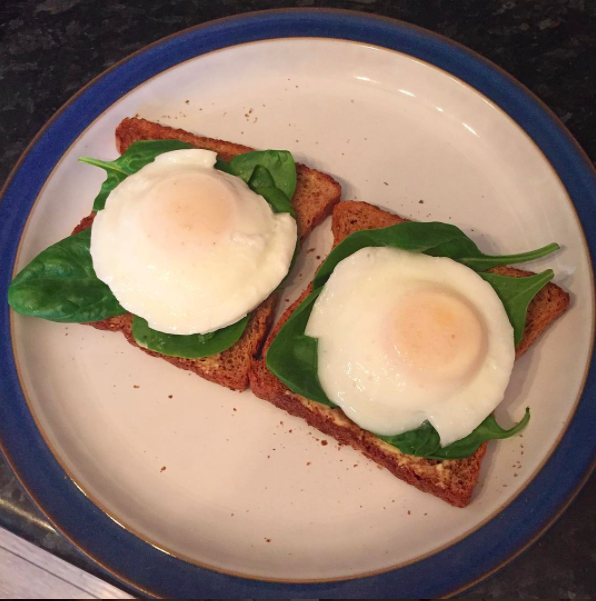 I make it no secret that I followed the Slimming World plan to lose my weight, but I thought I would do a post detailing exactly what I was doing and eating in case it gives anyone else some inspiration. 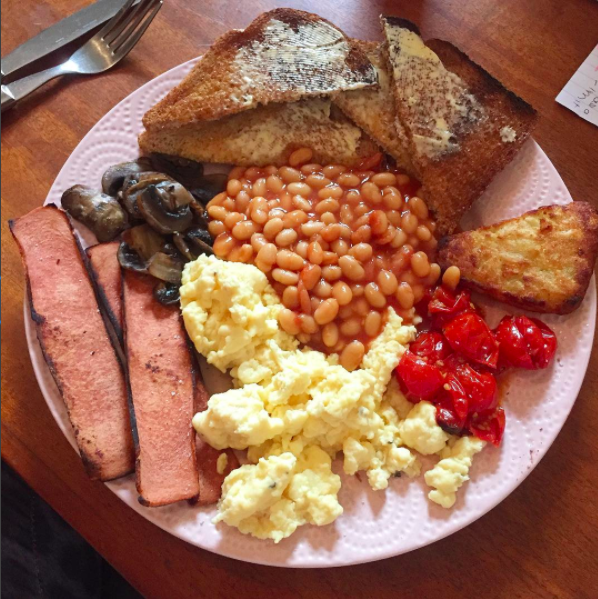 If you don’t know how the Slimming World plan works, then this blog post explains it quite well: https://bigfatmarathon.wordpress.com/2012/05/20/slimming-world-for-dummies/. Essentially, you have your free foods, your speed foods, your healthy extras, and your syns. You can eat as many free foods as you like as long as you make a third of your plate speed foods – foods that fill you but have little calories, which includes most fruit and vegetables. Most people follow the Extra Easy plan, but I followed the Green plan because I rarely eat meat. This meant that I could have an extra healthy extra A and an extra healthy extra B, which meant I could have extra calcium and fibre (so more bread and cheese most days). You have to measure the amounts of these that you’re allowed too. Most people that follow Slimming World go to weekly classes where they get weighed and discuss the plan, but throughout my weight loss I just followed the plan myself from home. 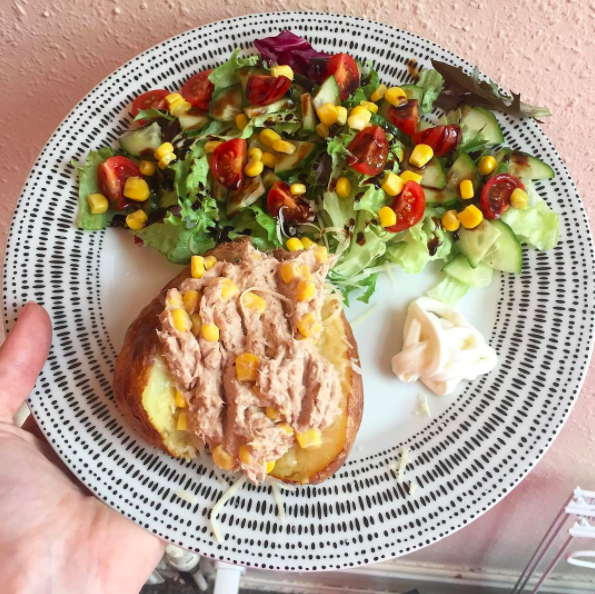 Jacket potato – if in doubt, I would always have a jacket potato for tea. Legit my favourite meal in the world and SO versatile. The potato is free and I’d normally have it with beans (P) and cheese (A) or tuna (P) and sweetcorn (F). I’d normally serve with a side salad too for extra speed. 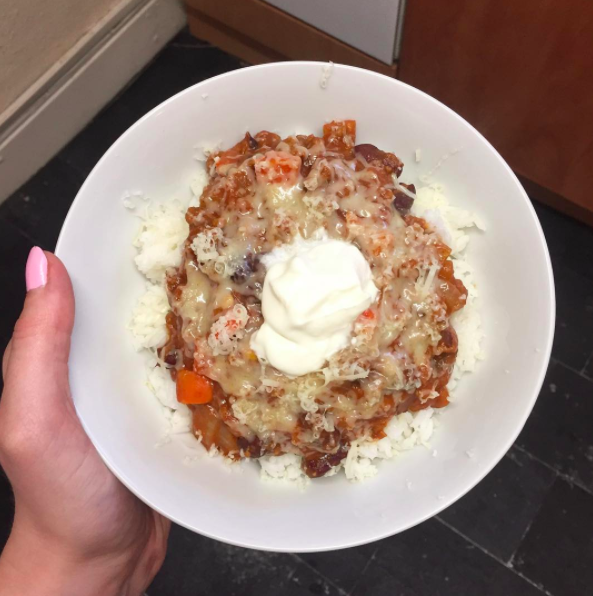 Chilli – I always follow the Slimming World recipe for this but use Quorn mince instead and it is delicious. Served with rice (F) and usually a little bit of low fat crème fraiche (1 syn). 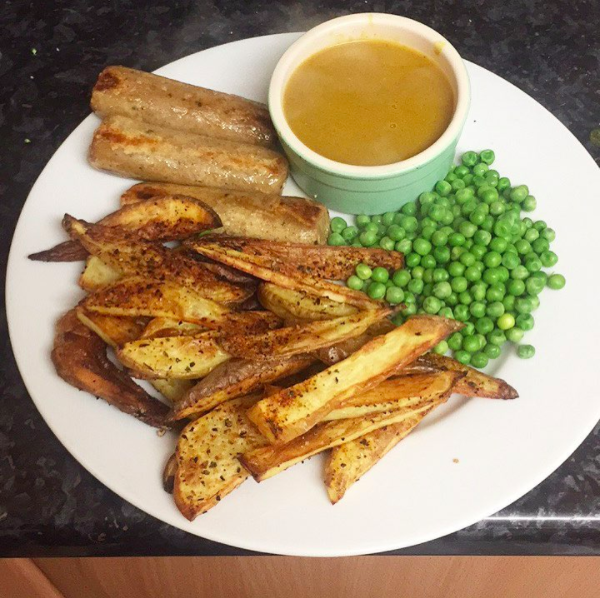 Alternatively I’ve also used the Heinz beans creations a few times which are lovely, so quick and low syn too so I would definitely recommend. 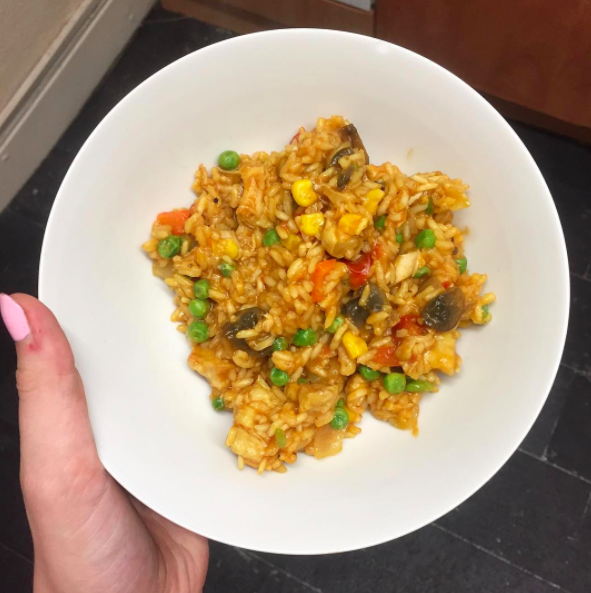 Chicken paella – another amazing Slimming World recipe and amazing to add whatever speed you have available, can easily be made vegetarian too by switching the chicken to Quorn pieces. 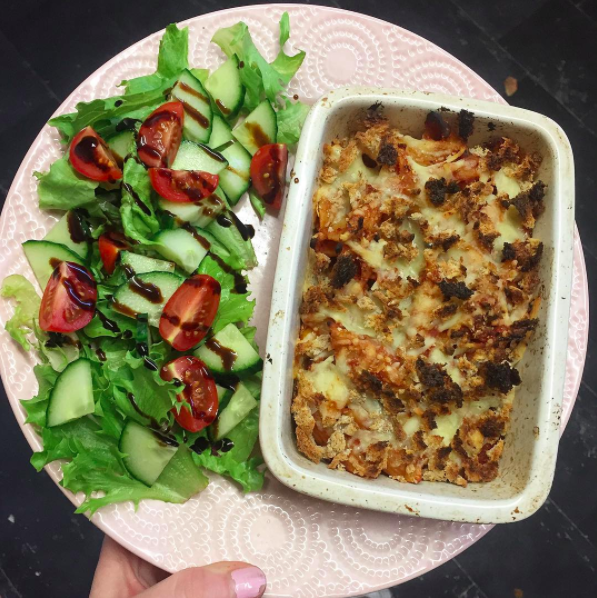 Pasta bake – I came up with so many pasta bake recipes whilst following Slimming World. Usually they consist of me making pasta with passata and fried vegetables, adding some crème fraiche, and then putting it in an oven dish and adding loads of cheese on top (always too much, I am obsessed with cheese). Adding breadcrumbs on top always makes it taste so much better too and you can use that as part of your hexB. 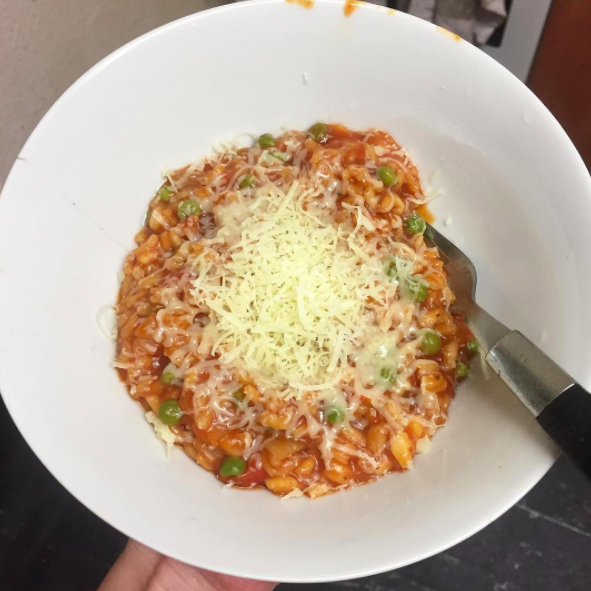 Risotto – I usually followed Slimming World recipes for this too but I made creamy and tomato flavoured ones. I’d always make extra and take it into uni the next day too. 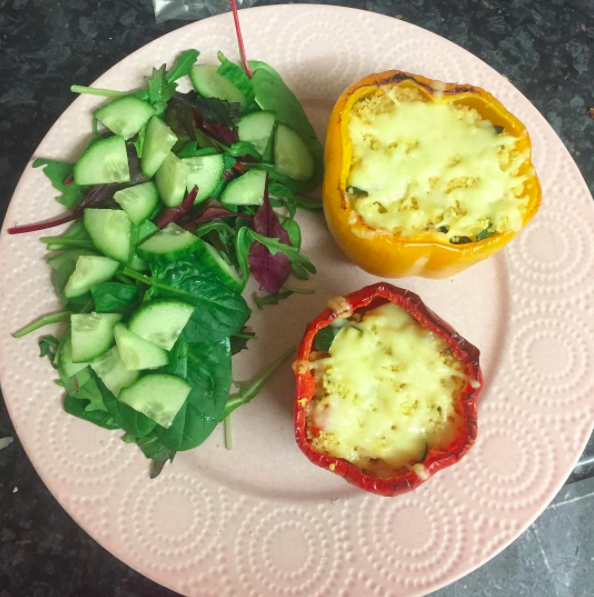 Stuffed peppers - I always made this when I needed something quick. Just roast some peppers, and as they're in the oven make up some couscous and add in some fried vegetables. Then put it in the peppers and add some cheese and put them back under the grill for a few minutes. 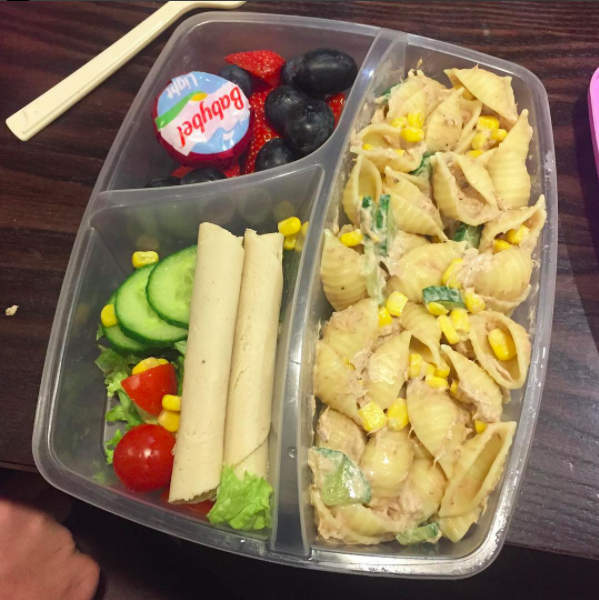 I would normally try and save my syns throughout the day so that I could treat myself later in the evening with a few low syn snacks, and sometimes I would take these to uni with me too in my packed lunch. I had a low syn stash in my cupboard at uni which was always stocked up. 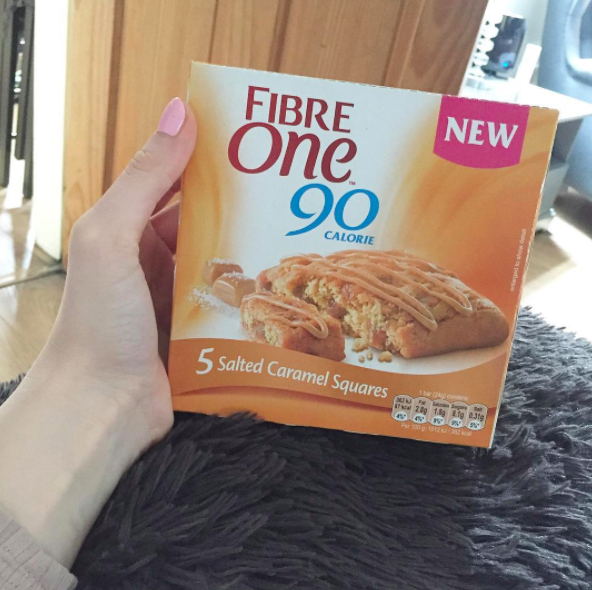 Sometimes it was a struggle not to eat these all at once, but only having the small packs meant that I wasn’t using all of my syns on one chocolate bar and that I could have a few different things with my daily syns. I actually set up a separate Instagram account for documenting my meals which is @sw_harley, I haven’t been posting whilst I’ve been away over summer but give it a follow if you want more of an idea of what I was eating. I’m definitely no gym expert and to be honest I’m not even sure if I was doing the right exercises to target where I wanted to lose weight, but it did seem to work to some extent. Towards the end of my weight loss journey when my progress slowed down I tried to switch up my routine a bit more, which is what I plan to do when I join the gym again in a few weeks time. Running has always been something I’ve wanted to be better at, so that’s what I started with most times I went to the gym. When I first went I would try and run for as long as I could, then walk for a few minutes, and then run again, until I’d been on the treadmill for about 20/30 minutes. Towards the end I realised HIIT training would be more effective for my last bit of weight loss, so I would sprint for 30 seconds and then stop completely for 30 seconds and then go again. After being on the treadmill I’d normally go on the bike for about 10 minutes to cool myself down as the treadmill wears me out. Sometimes I’d switch the bike to going on the cross trainer – at my gym there weren’t many bikes so I’d normally do this when they were taken up. Then I’d go on the step machine until I’d burned 100 calories which normally took about 10 minutes too. Then I’d try a few weight machines depending on how busy the area was, but I’d mainly just use the leg press machine. I’d then go on the mats doing other exercises (which I’m not entirely sure of the names of), but I’d do exercises in a rotation of 40 seconds on and 20 seconds off. Starting with a plank, sit-ups, crunches, moving a weight to either side with legs up, leg raises, and butterfly kicks. Then I’d get a bar and do some weighted squats, and when I rejoin the gym this is something I want to improve, as I never used a really heavy weight. My gym routine really wasn’t very exciting and was quite repetitive. I preferred going to classes more than the gym itself, and Spin class was definitely my favourite. I also liked Bodypump and Legs Bums and Tums but Spin was the class I went to the most frequently, I went at least once a week. In addition to this I was playing netball twice a week too, and my running in the gym definitely helped with my fitness in that. Sometimes if I couldn’t be bothered to go to the gym I would just go for a run around the block instead – when the weather got warmer we did that more often. When people see others that have lost a lot of weight when they want to lose it themselves, they always say ‘I wish I had your motivation’. Seeing someone lose such a big amount can be daunting when you think the goal is so far off for yourself. But it’s easy to forget that it’s a real journey, and it doesn’t happen overnight. If the thought of the amount you want to lose is daunting then start off small. I never thought I would actually lose 4 stone, I just recognised I needed to start somewhere and once I got going with my weight loss I then stayed motivated to carry on. It is a really difficult thing to do, and it takes so much determination. I know it’s a cliché, but honestly, if I can do it then I’m positive that anybody can. 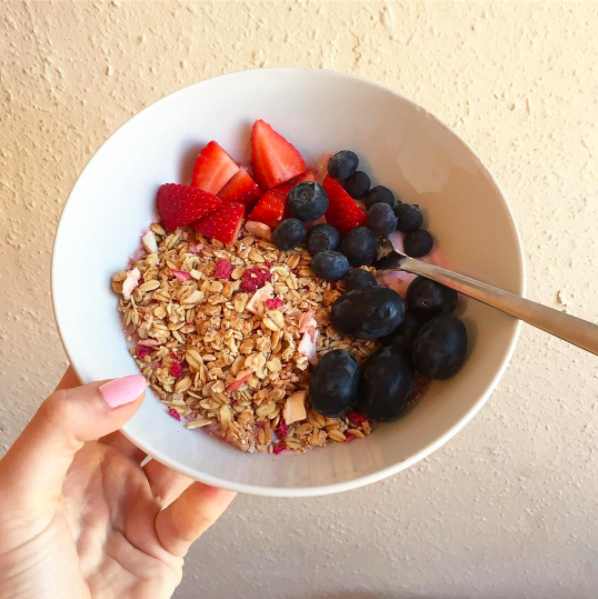 I think it’s all about allowing yourself everything in moderation, and that’s why I found Slimming World so easy to follow because you’re not cutting anything out completely. You’re allowing yourself what you enjoy, just in moderated portions. I never stuck to plan completely over the year that I was losing weight, but I was sensible with my options. 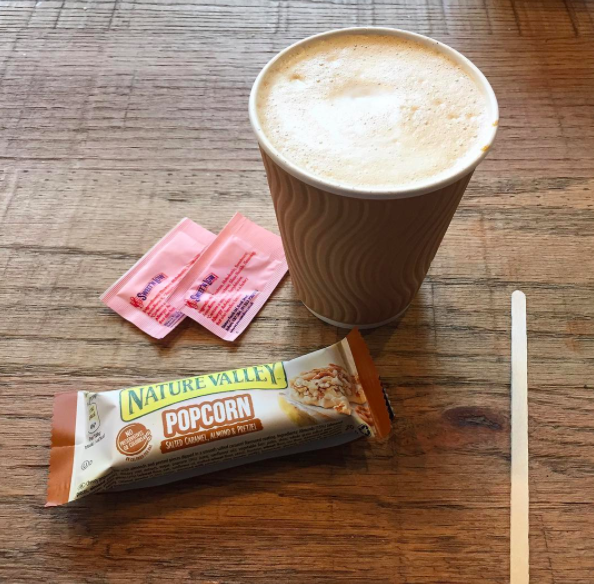 If I went out for a huge meal or had a takeaway one night, I didn’t let that carry on into a few days or a week, I made sure I got straight back on it the next day so as to minimise the damage. Even if I did let it carry on into a few days or a week, I never let it get further than that as I didn’t want to ruin the hard work I’d already put in. I think this is where the gym really comes in too, because actually going there and working out is so much effort, you really begin to question whether the food that you want is worth ruining the effort you’ve made. I know eating one takeaway doesn’t necessarily ruin the progress you’ve been working on, but introducing exercise into weight loss definitely introduces an element of routine which makes it easier to stick to eating healthily. I think one of the top tips I would give for anyone trying to lose weight is to switch up your meals so you always have things to look forward to. Try new recipes and make meals that you’re actually excited about. If all you’re eating for tea every night is chicken, rice and vegetables, you’ll get bored so quickly and fall out of the routine within a week. If you switch your meals up each week it makes it much easier to stick to as it doesn’t even feel like you’re being restrictive. This was why I often tried to save my syns until the end of the day too, because if I knew I was having something nice that night it made it easier to stick to plan throughout the day as I knew I had something to look forward to. Planning meals ahead is another big tip, and preparing meals in advance for the next day saves so much time and gets rid of the temptation to buy unhealthy food. It’s actually so difficult to eat healthily when out and about - unless you want to buy a Subway salad – so I’d often make an extra portion with my dinner and then save that for the next day and heat it up at uni. This saved so much time for me (and money too). 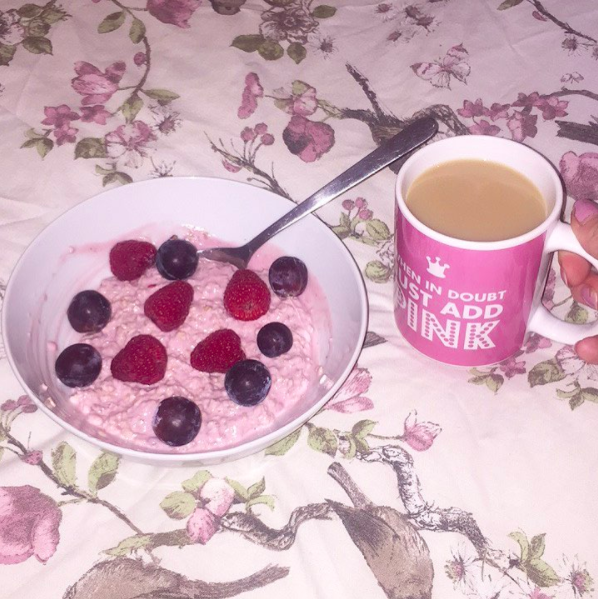 Slimming World itself is good for motivation as there are so many Instagram and Facebook pages that exist about it which work as motivation and offer meal ideas. When I was going through times when I felt stuck, I would look at the transformation pictures on the pages and realise that I could do it too. I think as well when you start losing weight, you even start to become your own motivation. Looking at old pictures of yourself where you didn’t like how you looked motivates you to carry on. 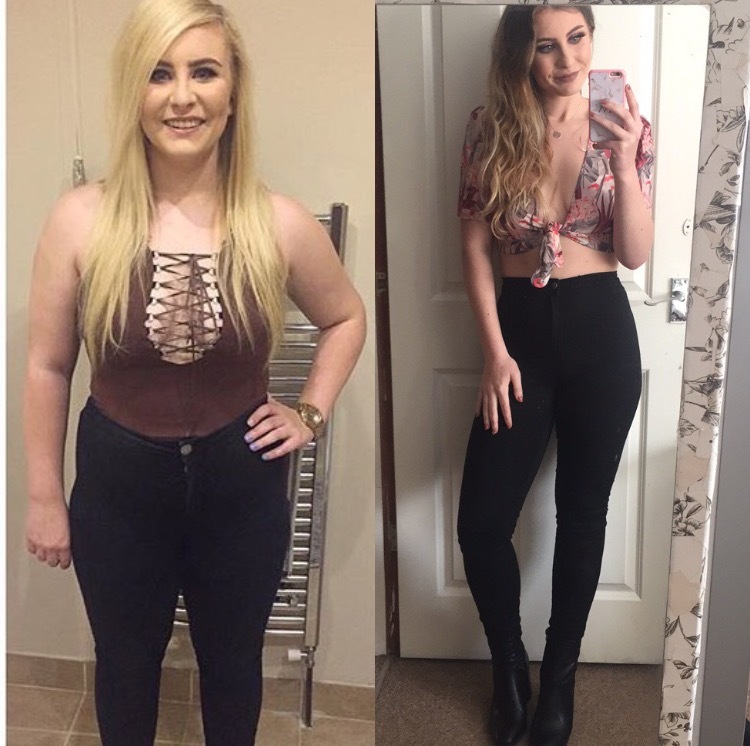 When my clothes started to become too big for me and I could finally fit into clothes I hadn’t worn in 6 years, that was such a motivation for me as well. 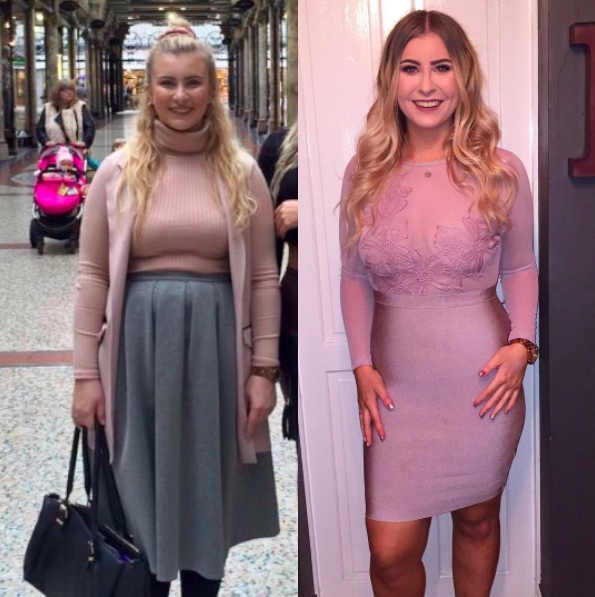 There were a few items of clothing I had wanted to wear again that had been too tight for a long time, and finally being able to fit into them again was such a personal achievement for me which spurred me to carry on. Weight loss is such a hard thing to do, and it takes so much consistent determination and willpower, but honestly it’s the best thing I’ve ever done. Starting out on that journey is a bit daunting, especially when you feel like you have a long way to go, but it’s important to take one step at a time and just go at your own pace. It’s so easy to look at other people and think you should be losing more quickly, but it’s proven that losing weight slowly actually means that it’s then more likely to stay off. 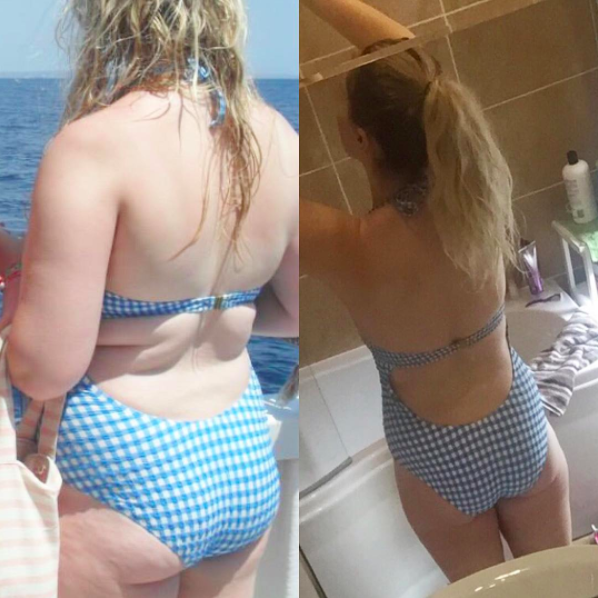 There were times that I really didn’t feel like I was getting anywhere, especially when I was going to the gym 4 times a week and didn’t see the pounds come off for weeks. But it’s a gradual process, and it’s important not to fixate on weight either, as I’m sure my body was changing from my gym progress, the scales just weren’t showing it. There were so many times I struggled but I persevered. I would go to the library to revise and my snack would be pomegranate seeds, whilst the rest of my friends brought Haribo to motivate them. Over the last year, I really learned to grow willpower, and I've learned that you don’t always have to say yes when people offer you food. It’s surprising how much you actually stick to something when you have an end goal and you’re in your own routine. I think the most important thing also is accepting that you’ll have days where you’re not perfect or you’re off plan. You just have to remember not to get tied down by them, accept it and move on rather than making it a bad week or month. I am my own motivation. 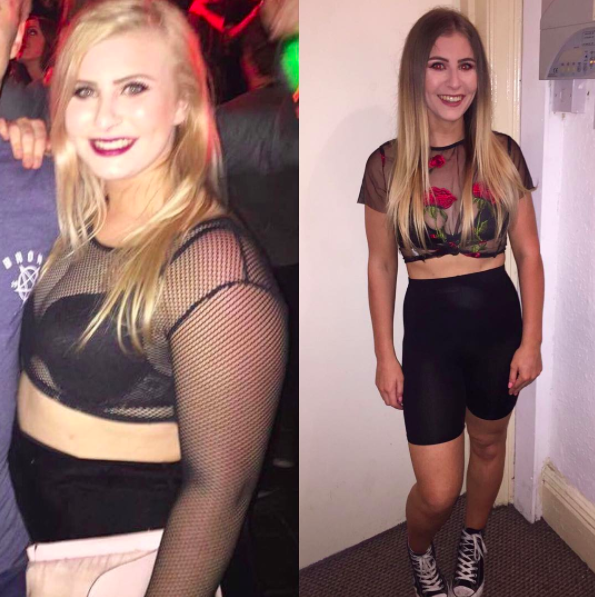 I am so incredibly proud of how far I’ve come in my weight loss journey, and I honestly can’t believe I’ve actually lost 4 stone in just over a year. When I started losing weight I made it my target, but I never imagined I would actually reach it, it seemed so far away from where I was. I don’t think anyone thought I would actually do it – years ago I used to receive anonymous messages repeatedly calling me fat and telling me how much weight I’d put on (like I didn’t already know). They'd ask me why I'd gotten so big recently, told me the clothes I wore weren't flattering and I didn't know my own dress size, and that I'd never lose all of the weight that I wanted to. I really hope those people can see me now. This post was a rather lengthy one, and it’s probably the most personal I’ve ever been on my blog so far. But this post has been requested by a few people so I wanted to make it a good one. I really hope you found it useful and that I covered everything, but if you have any other questions feel free to fire away. Really inspirational post. I've been planing on losing a stone and half over the past year. But have just been putting it off, but reading this post has really inspired me to get started. Wonderfull post thanks for sharing. Tin signs are regularly found in bars or eateries everywhere. The greater part of these spots would have the tin signs held tight the dividers or nailed to eating stalls. The tin signs come in numerous shapes and sizes and would regularly portray toon characters, great publicizing.For more information to visit my website.